The former PM said Canada will prevail in getting a new free trade agreement with the United States. "When fear and anger fuel much of the public debate, history teaches us that protectionist impulses can easily become a convenient handmaiden,'' he said. 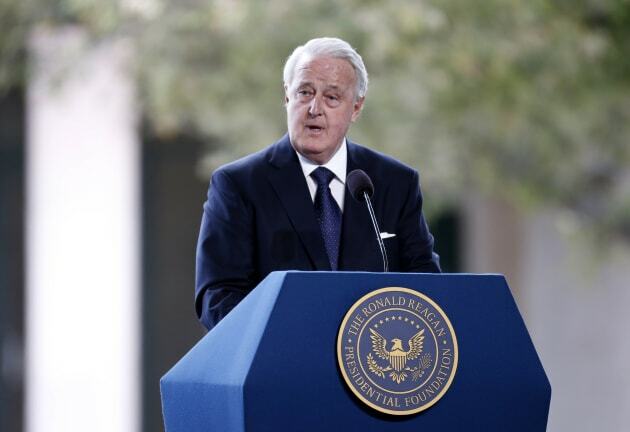 Former Prime Minister of Canada Brian Mulroney speaks at the funeral of Nancy Reagan. Trump has been all over the map on what he wants to see with the deal, from tearing it up entirely to just "tweaking'' it. Prime Minister Justin Trudeau's government has spent a significant amount of time and political capital lobbying Americans ahead of the expected negotiations, on the benefits of NAFTA and the damage that could be wrought by cutting trade between Canada and the U.S.
"This is in conflict, a variance, let me put it that way, with what you see in Washington with the Congress seriously divided on everything, including this,'' said Mulroney in a scrum with reporters following the speech. Mulroney said he understands the anxieties created by the fast-paced changes in our world but he said it is unfair and unwise to make trade the scapegoat.